The kind people from FoodNews invited me to Majestic Bay Seafood Restaurant recently for a food tasting event. Here's some background info on Majestic Bay. It's located at Gardens by the bay and is well known for it's classic dishes like Chilli Crab, Steamed Fish, Roast Meats and Peking Duck. Before I headed down to Majestic Bay with my friend Jimmy, I read up on Majestic Bay and found out that their signature dishes were actually their Kopi Crab and Baked Rice with Seafood. I found out from Janice, the nice PR girl that Majestic Bay Seafood Restaurant can seat up to 110 pax. They have cosy rooms for private dining sessions if you'll like to book for your family for the upcoming CNY. Enough yabber, let's get to the main point. The food! First up! 3 selections of dimsum. The XLB was yummy though not the best that I had. I thought that it wasn't served warm enough and the dough/skin was a bit too thick. 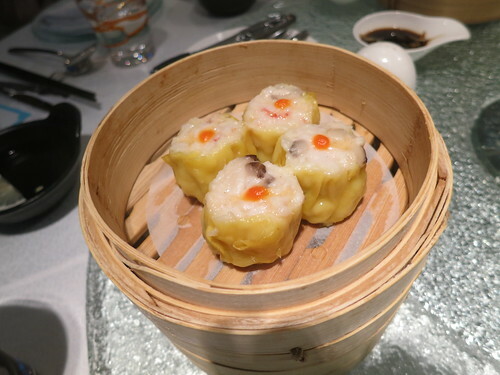 The siew mai was yummy and contained both pork and prawns. Very similar to most dimsum places. This, my friend, is awesome stuff! It was the first time I tried this. I thought the buns were rather unique. The seared bun was crispy on the outfit with the rather generous sprinkle of white sesame seeds and spring onions and the softness of the dough inside was rather delightful. However, I did feel that the filling was rather little. I could hardly taste the chilli crab, only a teeny hint of it. Hope that Majestic Bay would increase the chilli crab meat filling soon! I liked that the prawns were halved which really made it easy to deshell the prawns. It was really easy to eat. The prawns were rather fresh but I felt that the garlic wasn't strong enough. Was a tad disappointing for me. Definitely the star dish of the meal. We heard from Janice that this dish was actually Chef Yong's creation. As a true blue lover of coffee himself, he researched for a long time on how to marry his love of coffee and crab. For this dish, he used 3 different types of coffee beans: Arabica, brazilian and white coffee beans. He added other ingredients like jam, butter and wine. The smell of the coffee was really 'wow'. I was a bit apprehensive before trying this dish as I don't drink coffee at all. But it turns out that it wasn't bitter at all and infact was quite sweet. I really like this dish! The only problem was that because of the flambe, the meat stuck to the shell, making it rather difficult to eat. I was tackling this huge piece (as big as Jimmy's iPhone!) for the longest time much to Jimmy's amusement. Meh! The baked rice with seafood sauce reminded me of a sweeter Jap curry with a generous service of cheese. It does not look much but to me, this is THE must order dish! The seafood encompasses of baby abalones, mussels, prawns and scallops. I could find no fault with this dish. Really tmd shiok! The radish cake was very fragrant and soft. The XO chilli sauce was a nice touch to the dish. Sedap! A bunch of hits and misses in my opinion. I only liked the Bay's Chinese Pancake, Red Bean Paste and the Salted Egg Yolk. The Salted Egg Yolk bun was still a bit disappointing. As you can see, the dough was rather thick and the filling wasn't enough. Overall, I did enjoy myself though there were a few dishes that I will be sure to avoid the next time I visit Majestic Bay Seafood Restaurant. However, some of the other food bloggers really enjoyed the dishes I disliked so I guess it's to each his/her own. Do try it for yourself and let me know which is your favourite dish. Skyve Wine Bistro: A nice place to chill. Posted in Food, Reviews. Tags: Baked rice with seafood, Chef Yong, Chef Yong Majestic Bay, Chili Crab Seared Bun, Chinese new year restaurants, Chinese restaurant, Chinese restaurants in SIngapore, Coffee Crab, food reviews, FoodNews, Good chinese restaurants in Singapore, Kopi Crab, Majestic Bay, Majestic Bay Restaurant, Majestic Bay Restaurant reviews, Majestic Bay reviews, Majestic Bay Seafood Restaurant, Majestic Bay Seafood Restaurant reviews, nadnut, Singapore Food Blog, Singapore Food Blogger, singapore lifestyle blog, singapore lifestyle blogger, Where to go to for Chinese New Year?, Where to go to for CNY?, where to go to for good chinese food? on January 16, 2013 by nadnut.